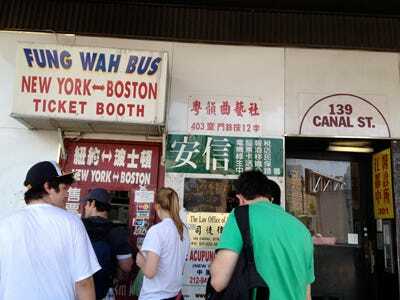 The federal government has shut down Fung Wah Bus Transportation, Inc. — more commonly known as the “Chinatown” bus — after a number of its vehicles failed safety inspections, according to CBS in Boston.The company, known for its cut-rate bus rides between New York City’s Chinatown and Boston’s Chinatown, came under fire earlier this month when Massachusetts inspectors found cracked frames, oil leaks, and other hazards on many of Fung Wah’s buses, according to CBS. But now the U.S. Department of Transportation’s Federal Motor Carrier Safety Administration has stepped in, demanding that the operator cease using its 28 buses and conduct thorough safety inspections. (The FMCSA) has ordered Fung Wah Bus Transportation, Inc., to immediately cease passenger service and provide its entire fleet of 28 motorcoaches for thorough and detailed safety inspections by qualified inspectors … FMCSA’s safety investigators are continuing their examination of Fung Wah’s operations, including examining the safety records of its vehicles, drivers and other company safety performance requirements prescribed by federal regulations, and may consider additional actions against the company if warranted. No word yet on what the “additional actions” could be, but the operator could be out of commission for a while. Fung Wah and other Chinatown bus operators have faced safety concerns in the past. In May, federal regulators shut down three bus lines that run out of Chinatown over safety issues. According to the company’s website, it is the largest bus service provider between New York and Boston, and has operated for more than 10 years. One-way tickets on the Fung Wah run around $15.